This ever happen to you? You go out to your never diminishing wood pile looking for an afternoon opportunity to make something on the lathe. You sort through the various pieces and shapes looking for the volunteer to jump out and yell, “Pick Me! Pick Me!”. So you pick that promising young piece out of the pile and realizing it is too big for your lathe you break out the chainsaw or band saw to cut it in half. Only to your great disappointment you find when the wood is laid open, that there is a rotted center, or a gnarly-looking crack running right through it. There was a time when I would have had a few choice words to say as I threw the piece into my ever-growing wood trash pile for burning. Well not any more. I cherish those finds (most of the time). To me, turning a piece of wood with heavy bark inclusions, knot holes and cracks, water and decay stains, and worm holes and insect infestations is more satisfying than any other turning. Don’t get me wrong; I appreciate a beautifully seasoned and flawless specimen of wood that has been turned with artistic precision into a finely sculpted vessel. Work like that is timeless…It’s just not me. Now I know this is hard to believe, but you will just have to trust me on this…I have flaws. No, it’s true. I know that is hard to accept, but beneath my balding head and drooping physique, I am not perfect. I have faced this truth and have also realized that this fact is true of every other individual on the planet. Because of this, I have come to the conclusion that human beings look for flaws in things and upon finding them, become more accepting. Personally, I am intimidated by perfection; I feel more relaxed and comfortable around something that contains slight imperfection…in art, in people, in life, and in wood. Therefore, as my woodturning experience has moved me through the years, I find myself thinking less about a specific vessel shape or size to turn as I head toward my shop. Instead, I find myself out near the woodpile with a cup of coffee, staring at an excavated tree stump covered in dried mud and ants and wondering to myself….”What is in there?”, “How can I get something out of this?”, “Where is the coolest grain or water damage?”, “If I did this, how would I mount it on the lathe?”. Once on the lathe, with the vibration shaking the shop from the almost always out of balance wood, the transformation begins. Shavings pile up mixed with the chunks of dirt clods or mud. Half drunken insects cover my face shield as they try to recover from the centrifugal nightmare from which they just emerged. Intermittent cuts challenge me the whole way, but the piece begins to emerge. A shape, a form, consisting of both positive and negative space is being created. It consists of inspiring wood grain that highlights the tree when it was in its prime, yet complimented by the same wood in stages of decomposition. It is finding this balance in both the prime of life and the latter stages of natural forces that make me identify with a piece and I am comforted as a human being. So what one man might throw out as trash, I now look for as opportunity. I challenge you to do the same. Be safe. Mount the pieces solidly, use eye and hand protection, and stop often to examine the condition of the wood for structural weaknesses. But don’t pass up on a piece of wood because it has some flaws, instead, embrace it. I have been turning for a little over three years as a hobby and a time killer. This month I plan on talking on this issue and some of its challenges. I will bring a challenging piece of wood and we will open it up on the lathe and see what it holds for us. It may be nothing special and it may be spectacular, but one thing is for sure....it will be unique. 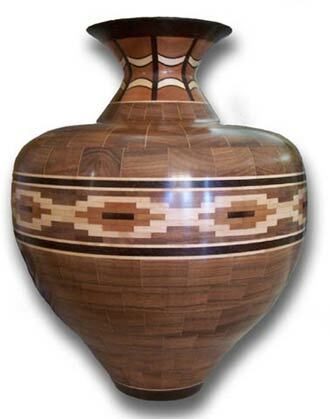 "Creative Designs Using Scrap Wood"
Wyatt Compton has been a member of the Woodturners of North Texas for approximately six years. He was proud to host two of the sessions titled "Creative Designs for Pen Turning" at SWAT this past year in Wichita Falls, Texas. Wyatt specializes in transforming wood scraps and "trash" into turned pieces which can be something unique and beautiful. 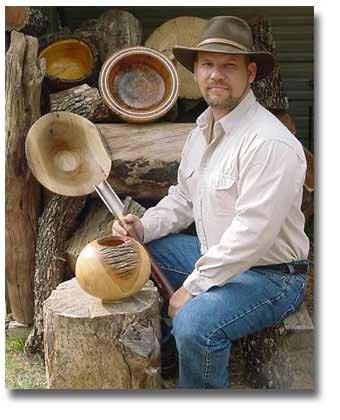 Wyatt credits Dr. Alan Siebenthall for introducing him to the dynamic world of wood turning and he really enjoys being a member of the Woodturners of North Texas because our members enjoy sharing information and ideas. Wyatt's goal is to inspire each of us during this program to view wood scraps with an eye for the potential beauty they can become. Wyatt will feel satisfaction if he can, in some small way, contribute to the development of a finely turned object of which it's creator is really proud. 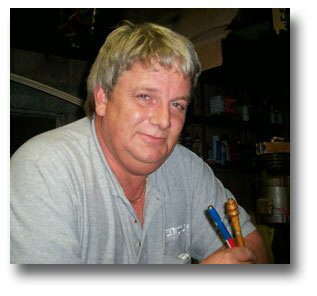 My working life was forty years in the Tire and Auto business. The last fifteen I owned my own company (Cordy Tire). I sold the company in 1989 and built a home in Lost Creek (West Fort Worth) and in 1990, I built a log cabin on the Llano River in the Hill Country. After building two houses, and not getting any younger, I felt I needed to work on things I could hold in my hands. An old friend in Kansas City, Missouri called and ask me to come to his shop and learn how to make a bowl. In three days I was hooked and thirteen years later I'm still at it. For the first three years I did segmented turning only and the next five year I went totally to green wood. In the last four years I started doing both and enjoy the challenge. At last months meeting I showed a vase that has 1,067 pieces of wood in it. My demonstration will cover the techniques used in its construction. Larry Roberts demonstrated his techniques for turning a large natural edged bowl using mesquite wood. This included selecting wood suitable for the purpose, mounting it on the lathe in order to achieve balanced edges, how to quickly and solidly secure it to the lathe spindle, turning a tenon for mounting the bowl on a scroll chuck, turning techniques for the outside, securing the bark to the rim of the bowl, and hollowing the interior. He also discussed sanding and finishing and design elements to achieve a balanced and appealing design. Larry Roberts has been turning wood for approximately fifty years and is the founder of the Woodturners of North Texas.